Bailey Intermediate fourth-graders take apart Oreo cookies and carefully craft the frosting to make the eight phases of the moon. 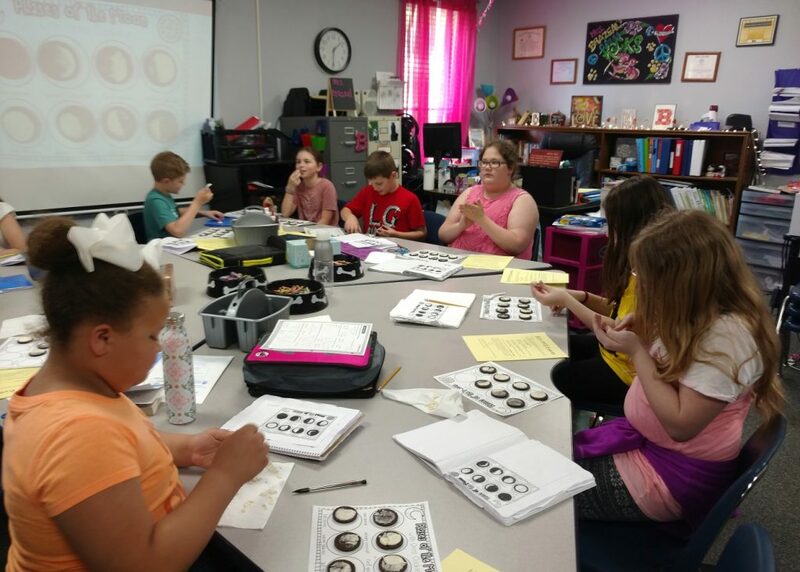 Students in Michelle Brazeal’s fourth-grade class at Bailey Intermediate used Oreo cookies to learn about the moon phases. Each student carefully separated four Oreo cookies keeping the frosting in tack. Then laying the cookies down as demonstrated on a handout, they scraped off the frosting or possibly transferred it to an empty side creating the eight phases of the moon. Extra cookies were on standby to replace the broken ones or the ones that went missing. The phases illustrated included the New Moon, Waxing Crescent, Waxing Half (First Quarter), Waxing Gibbous, Full Moon, Waning Gibbous, Waning Half (Last Quarter) and Waning Crescent. Clean up was a breeze for this project!